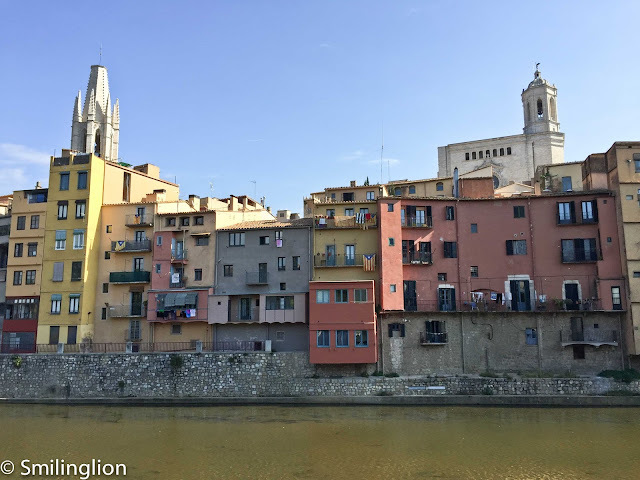 On our way from Venice to Lake Orta in Piedmont, we decided to stop over for one night at Da Vittorio in Bergamo. It is our favourite resort in Italy, with its place in the hills outside Bergamo, vast grounds with a lake at the front and vineyards on the hill behind, well-equiped and luxurious accommodations and a 3-Michelin star restaurant (see earlier reviews: Da Vittorio 1 and Da Vittorio 2). Having arrived there just after noon on a Sunday, we were starving and decided to stay in and have lunch at the restaurant there (since all the other restaurants in the nearby town of Brusaporto were probably closed). Sunday lunch at Da Vittorio seemed to be a grand affair. It looked like Who's Who from Milan were there, driving down from the city in their Bentleys, Mercs, Ferarris and Lamborghinis; with men in their finest sunday jackets and women in their fancy hats, scarves and dresses. We felt a bit out of place in our jeans, especially when we were placed at a table in the middle of the dining room. Fortunately, the staff did what they could to make us comfortable and even Chef Enrico Cerea came out to say hi. The Sunday lunch menu had the antipasto option, which was essentially enough hams, cheeses, bread to feed an army. But first, they brought out some amuse bouche of foie gras creme brûlée and whipped cream which were decadent. The best of Italian breads at a fine dining restaurant is always the breadsticks (the other breads tend to be cold and hard and lack the finesse of french breads) and those here were excellent. 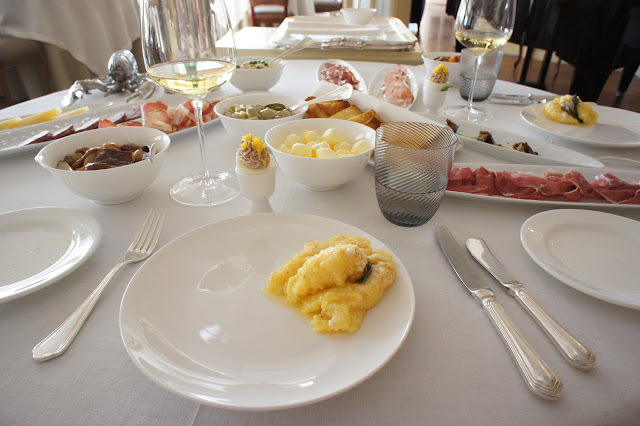 The antipasto spread was extensive, and came with different sorts of ham, salami, mortadella, olives, polenta, hard-boiled eggs and cheeses. They were all very well prepared and to my regret during dinner time, we couldn't help ourselves and managed to wipe out almost all of it. 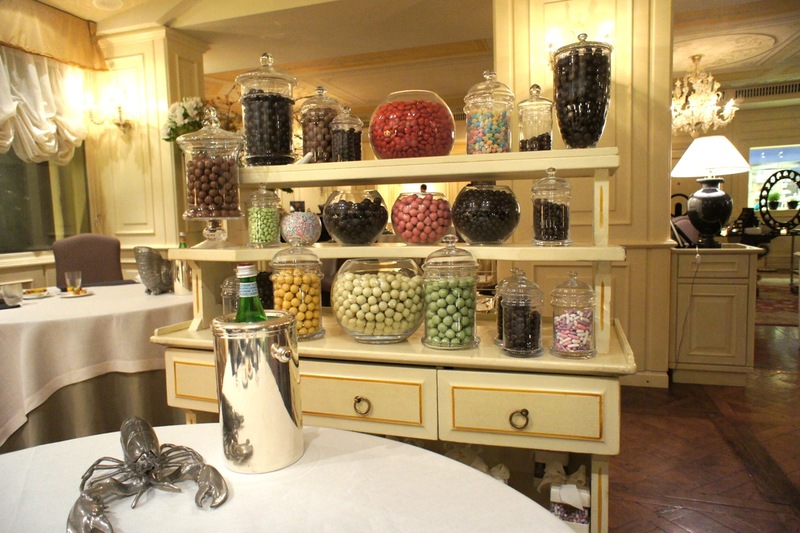 During lunch, we noticed that there was a large dessert buffet table in the centre of the room with an assortment of cakes, tarts and other desserts. We didn't think our antipasto menu came with dessert so we didn't think much of it. We thought this was some kind of dessert buffet which the other diners were having as part of their lunch. The pastry chef brought over some petit four to end our meal which was delightful. We went back to our delightful room (which had a courtyard. We really love the accommodation here) after lunch for an Italian-style siesta and a few hours later appeared at the restaurant again for dinner. 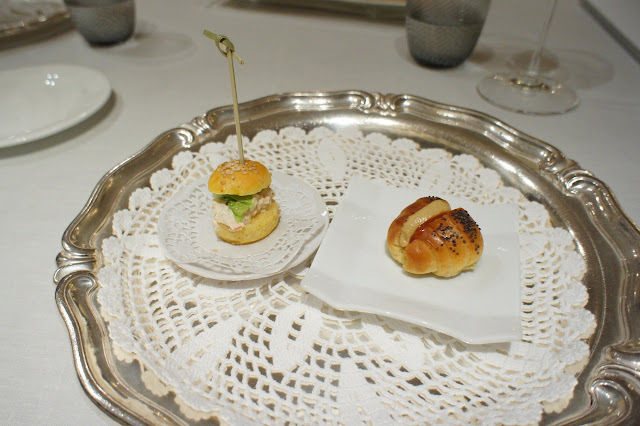 As was the last time we were here (when we dined here 2 dinners in consecutive days last year), Chef Enrico remembered not to serve us the same amuse bouche but had to come up with something different. This time it was a pair of mini crabmeat burger and hotdog. They were nice but nothing to write home about. The wine list in Da Vittorio seemed pretty dear compared to what we were paying when we were further east and south. Our impression was that even the wine list in Venice was slightly cheaper which was surprising. That said, seeing the kind of clientele Da Vittorio gets (the well-heeled Milanese who drive or get chauffeured in from the city just to have a meal there), it's not entirely surprising. 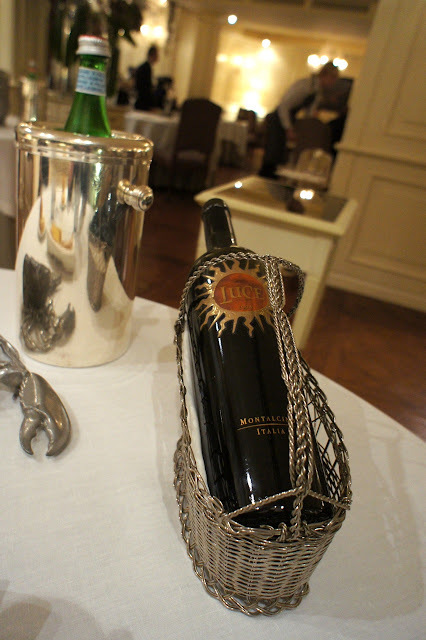 We chose a 2004 Luce, a Supertuscan which we had not yet tried. It was a rich and full flavored wine, still tannic and powerful but drinking well. During last year's trip we were having the Nebbiolos of the Barolo and Barberesco; this year we were starting to develop a taste for the Sangiovese, especially those blended with the french grapes. Strangely, it is our impression that the Barolos attract a price premium over the Supertuscans in restaurants in Italy (at least at the restaurants we dined at) whereby this seems to be the opposite outside of Italy. 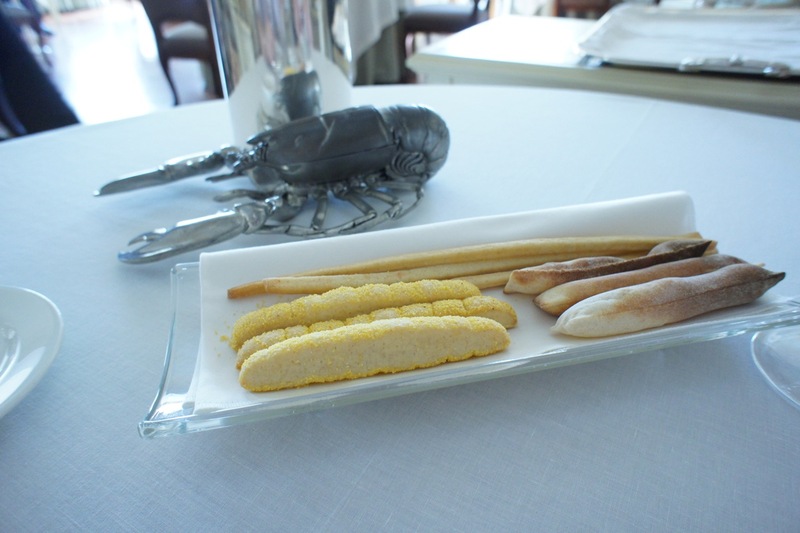 We opted for the seafood menu, which gave Chef Enrico a free hand to prepare us dishes which are mostly seafood based. Looking around the room, it seemed to us that the dishes he prepares for different tables (all having the same seafood menu) could be different. During the meal, he kept coming over to speak to us and get our views on how the dinner was progressing, and then we think he would then tailor the next dish to the feedback he got. Each table seemed to get something different. 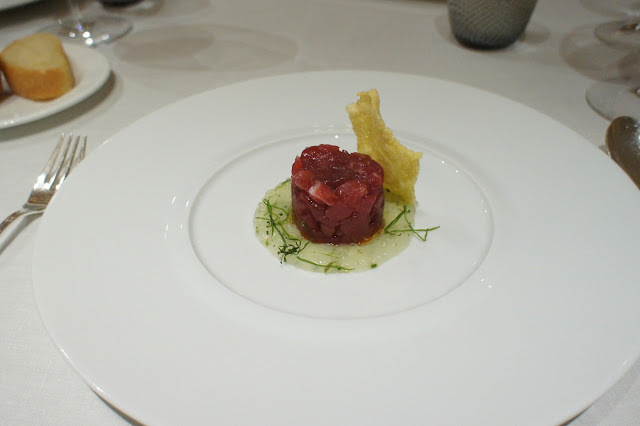 Our first dish was the tuna tartare on a bed of lime and basil jelly and accompanied by a fish cracker, which was a good combination of flavours and was excellent. Next was the prawn carpaccio in olive oil which was also very good. We also really liked the lightly grilled squid with citrus foam. 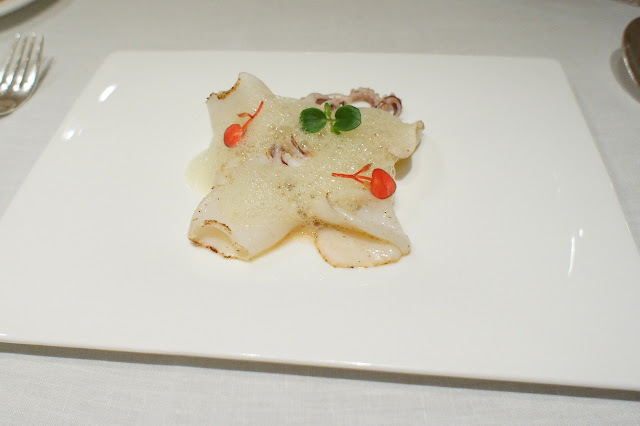 The squid was juicy and succulent and together with the foam, this was a very light and refreshing dish. 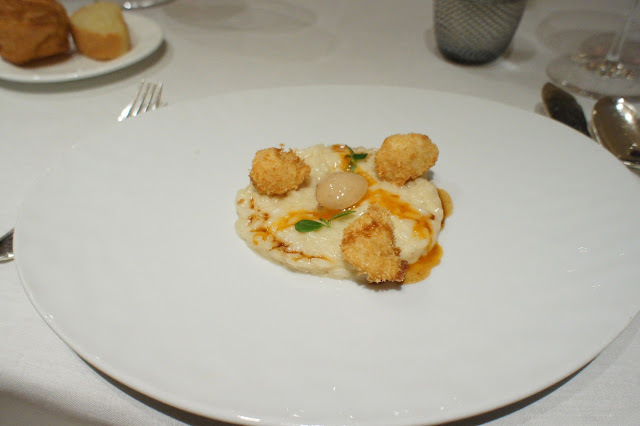 Next was the risotto with breaded prawns and something which looked like a quail's egg but was actually seafood stock enclosed by a thin membrane which, when put into the mouth, exploded into flavours. The risotto was perfectly cooked and the whole dish came together very well. 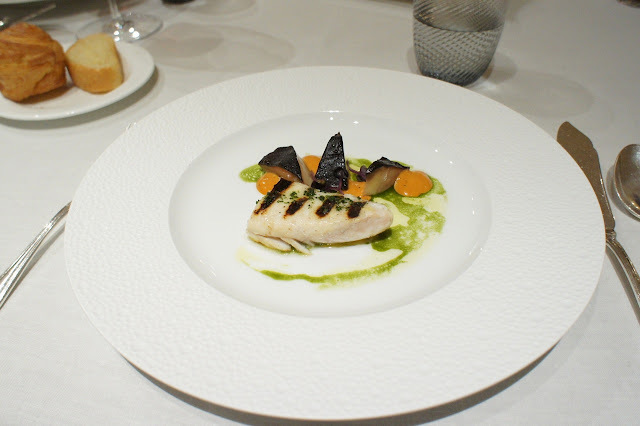 The grilled john dory which we had next was possibly the best john dory we have ever eaten. It was charred slightly and cooked to the exact doneness necessary to retain its juices and without it tasting too dry. 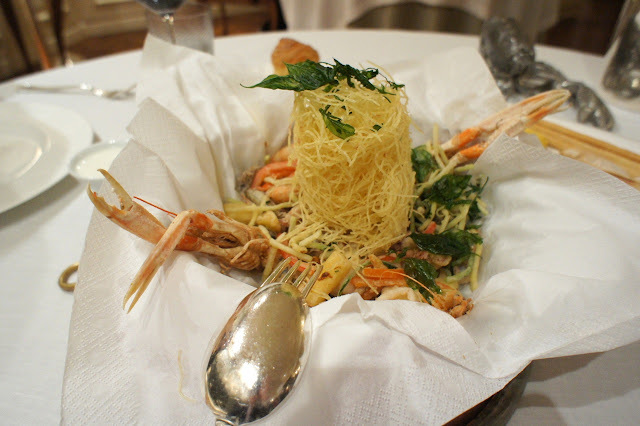 And finally, the famous seafood platter of Da Vittorio which was essentially a basket of various fried seafood. 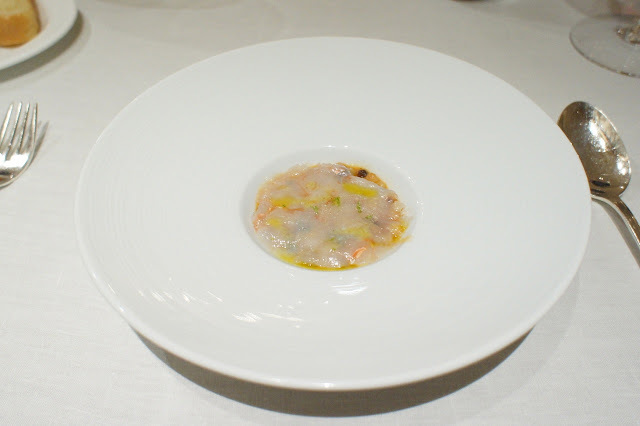 Compared to the dishes before it, this tasted almost ordinary (not helped by the fact that we had been eating fried seafood all throughout our trip in the Liguria region and in Venice). Besides, we were so full by that point with the heavy lunch and all and struggled to finish this dish. Most puzzling, there was no dessert course. 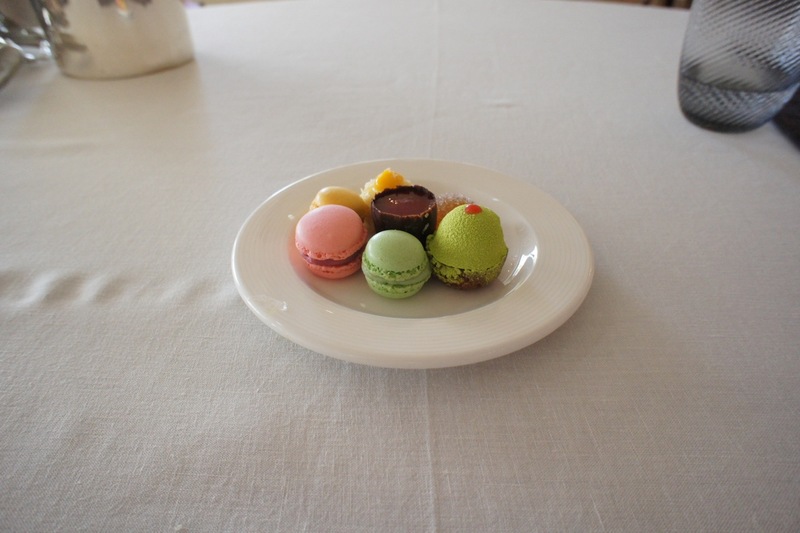 Instead, there was a dessert table in the middle of the dining room which had a selection of cakes, tarts and a chocolate fountain, which seemed almost tacky to us for a 3 Michelin star restaurant. None of them looked particularly appetizing for us so we skipped it. Chef Enrico personally took out a small plate of panettone which was very good, but this could not make up for the fact that he didn't have a dessert course or two for his degustation menu. Petit four looked very much like what we had for lunch. Having eaten here 4 times and for 3 dinners, we think that we have identified a big problem with the restaurant: they don't do their desserts very well. 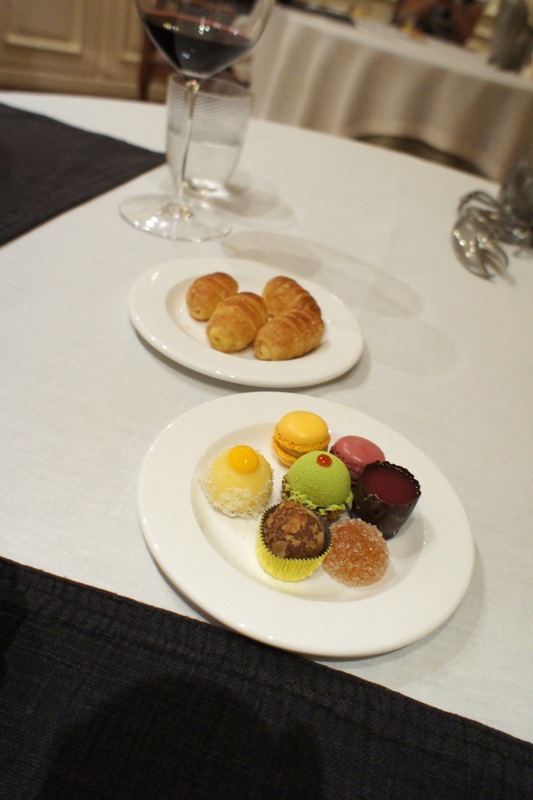 As we recall, we were served very simple desserts last year, but this year's 'dessert buffet' was unbelievably kitsch. 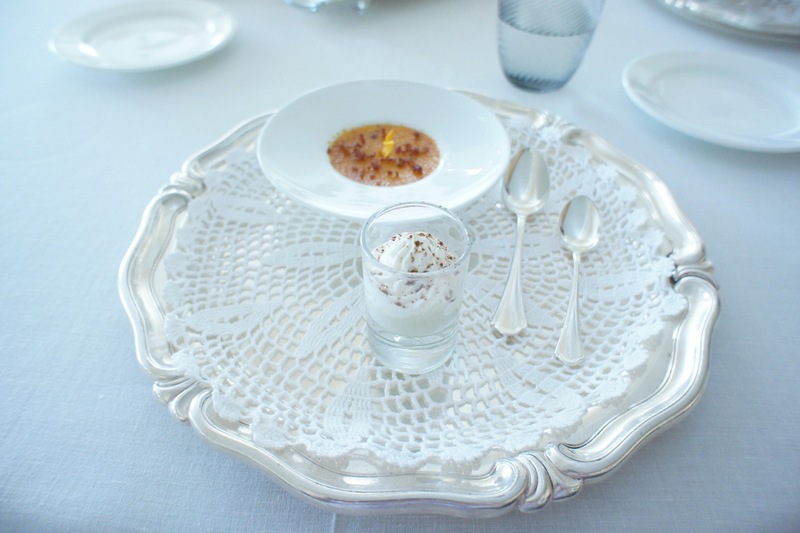 Chef Enrico is an amazing chef, his cuisine was consistently brilliant and his food executed perfectly most of the time, but he needs to sort out his dessert situation as it does a serious injustice to his restaurant. Throughout the dinner, we did not see many of the diners in the restaurant walk over to try any of the desserts on the dessert table; I guess the other diners probably felt the same way as us. 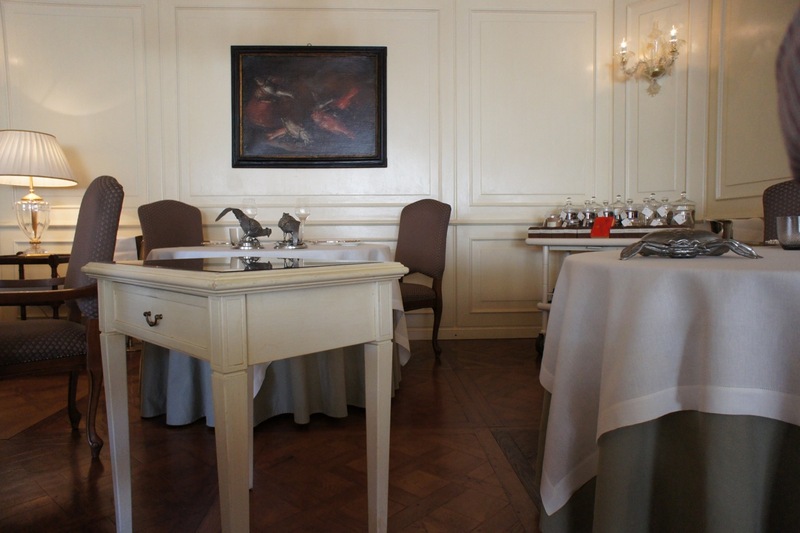 If we were to dine at a 3 Michelin star restaurant, we don't expect to have to walk to get our food. The service was good and Chef Enrico was hovering around fussing over all his guests, which put a noticeable strain on his staff (he had a young waiter who looked just like Fernando Torres - he kept getting scolded by his fellow waiters and Chef Enrico for being less than meticulous). It seemed like a tough crowd that night for Chef Enrico, with a few tables of customers who were demanding regulars. The stress on Chef Enrico was quite visible on his face, especially towards the end of dinner when it appeared that all his diners looked quizzical about the lack of dessert. Fortunately, they still had their sweets trolley, from which we picked out some chocolates to end our evening. One of things we love about this restaurant is the large fire they have outside the restaurant especially during the colder months. 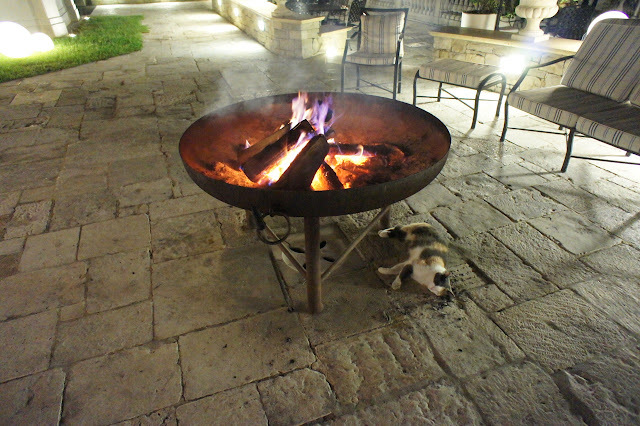 It is a very nice break from a heavy meal to go outside and stand by the fire. The resident cat which we saw last year was back again in its favourite spot under the fire. Final Thoughts: We love this resort, but the lack of a dessert course this time round was a big letdown for us. In addition, we and our fellow diners were bothered by persistent flies during the meal and we thought the restaurant staff could have tried to do something about it (but they didn't). Despite a very nice lunch and some very good appetizers and entrees during dinner, our overall experience at the restaurant was dampened by these problems.